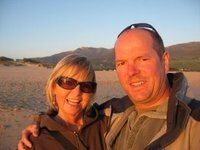 The efficient and friendly team at LivingTarifa specialise in flexible local rentals. Eduardo and his team speak Spanish, English and French and are happy to arrange all the details of your stay in our La Tortuga I studio (Ref: Studio 368). LivingTarifa will take care of all the arrangements such as availability, booking, arrival, guarantee deposit for keys and breakages, linen, cleaning, departure, etc. You can check availability of La Tortuga I and request your booking on-line, right now, via this link: La Tortuga I (Ref: Studio 368). Very importantly, during office hours, LivingTarifa are on hand in Tarifa. They are just up the road from the studio - on the opposite side to the Repsol petrol station and main bus station on Batalla del Salado. They will ensure that your stay is comfortable and enjoyable and can provide you with lots of useful local knowledge. We are a curious blend - total opposites who have shared life's challenges for over 35 years. We live in England but love to be in Tarifa as often as possible. Having travelled to many parts of Europe and around the world, we decided to find a place of our own in the sun. After a lot of searching, we eventually visited Tarifa in Andalucía, Southern Spain and fell in love with the place. It had just the right mix of people, culture, sport, nature and relaxation. Being right on the beach, in a small development with a shared pool and well maintained garden area was just what we wanted. Finally, in spring 2004, we got our 'Copia Simple' documents and started renting out our property - La Tortuga I. For 2014, we completely refurbished the studio to create a better layout, a new tiled floor, new kitchen area and a full height bathroom. In 2018, we fitted a new front door, updated the sofabed and changed the layout to provide more living space. Do enjoy your stay in our studio. If there is anything you would like to know or want to suggest - then please speak to our local team (LivingTarifa - HABITAT) or send us a message via our TarifaStudios Facebook page. We were the proud owners of a limited edition Piaggio Ape Calessino tuk tuk, which for 5 years was seen driving round the old town or down to one of the many nearby beaches. She moved to Arcos de la Frontera near Jerez in January 2016​.